Page title: Was Westmount’s Long-Time Hockey “God” Really a Monster? Was Westmount’s Long-Time Hockey “God” Really a Monster? “To countless Westmounters who played hockey, soccer and baseball, or just hung out at the arena, John Garland was synonymous with sports in the community,” reporter Laureen Sweeney wrote. He put together its first Family Day in 1976 and coached the city’s Peewee All-Stars hockey team for more than 30 years at a time when it was the only Westmount team that played against other municipalities. Many of his protégés continue to play, including Jeff Molson, owner of the Montreal Canadiens. Westmount’s arena, located four blocks from my childhood home, was perhaps the community’s most important landmark for hockey-obsessed boys. 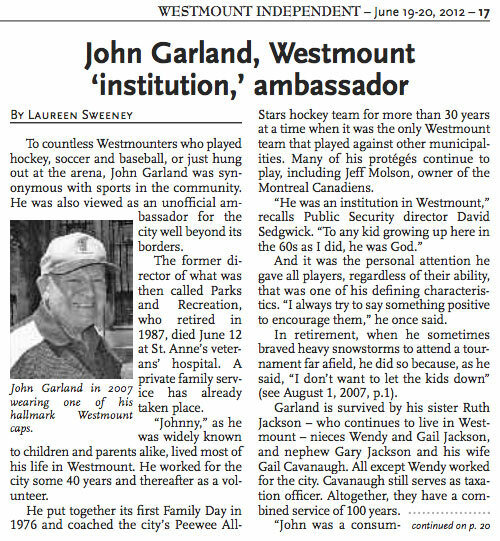 And its easy to see why some treated Garland as a “god.” He acted as Westmount’s Parks and Rec Superintendent from 1953 to 1987. For whole generations of kids, he was the last word on who made the cut—and there often was an active competition for his attentions. On every team, he had his favourite players—“Johnny’s Pets,” as they were known—to whom he gave lifts in his car and special access to his private locker. According to friends of mine with whom I grew up in Westmount (better hockey players than me—I never made the all-stars), this was well-known. These days, this behaviour would be regarded as creepy. In those days, it wasn’t uncommon. Informed readers will know where this is going. After Garland retired in 1987, he still hung around the arena as an “independent evaluator” for the league, attending (by his own estimate) approximately 500 peewee games per year. In 2007, the apartment building on Sherbrooke Street where he’d lived for forty-two years went condo; when he was forced to move out, it was treated as a minor local scandal. Scan the local media reports from the time of his death, and you will not find a hint that Garland was anything but the benign “god” of the local arena. This morning, a man roughly my age who grew up playing hockey in Westmount during the late 1970s and early 1980s—Benedict Matthew Bissonette—was listed as petitioner on a motion for authorization to institute a class action law suit against the City of Westmount, alleging that the city turned a “blind eye to the disturbing and illegal behaviour” of Garland during his lengthy employment tenure with the city. The details of this alleged behaviour—which have not been proven in court—are contained in the legal document that follows. If you have information related to this case, please email digital@thewalrus.ca.